As a school librarian, I often hear parents express frustration that their child is unwilling to read. In a world of screens, it is becoming more difficult to convince kids to hit the off button and crack open a good ol’ physical book. In working with students over the years, I’ve become more and more convinced that the difference between a non-reader and a voracious one is not locking their device in a safe. The secret is the right book. But most parents have read very few children’s and young adult titles. Even those parents who are strong readers themselves are, obviously, picking up stuff that appeals to them as adults, not titles for 12-year-olds. So how can a parent help their son or daughter find a “just right” book? Apart from reading everything that is published every year, here are some useful online tools for putting a great book into your child’s hand. Let’s just start with the kingpin of all book searches. If you have kiddos under 13, go straight to the Children’s book section. You can mouse over the Departments tab, then over the Books and Audible link, then over to the Children’s Books link. Here, you can browse age groups, categories, and personalized suggestions. For each book, you can often see the recommended age and grade levels. (I’m not positive where this information comes from, and I’ll have to investigate how well these levels correlate to established standards.) You can also, of course, read the reader reviews for the book. Always take reviews like these with a grain or two of salt. YourNextRead asks this question. 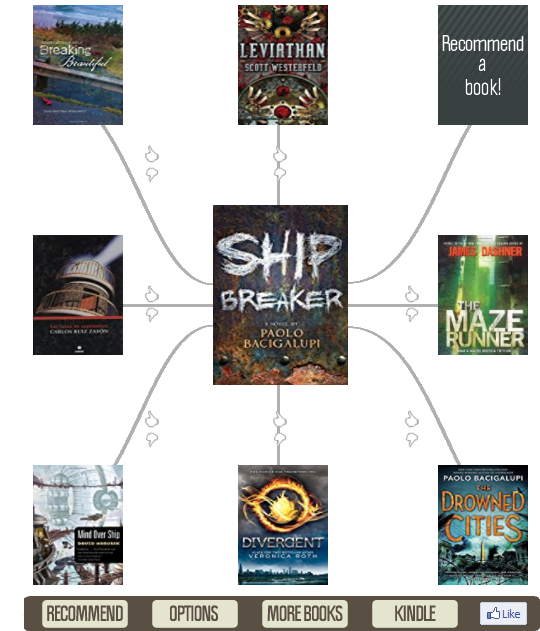 You start with a book you’ve read and liked, and the tool builds a web of similar books that you can browse through. Each click recreates the web, and you can end up going down a rabbit trail. But it’s a great way to quickly explore interests and possible new titles. If you’re looking for a search tool that’s a little more robust and geared towards children and teens, I’ll let you in on a little librarian trick. Use a great book vendor site like Titlewave. No, I don’t work for Follett and am not making a commission. As a matter of fact, I wouldn’t necessarily encourage you to buy from this site. Just find the books you are looking for. Create a free account on Titlewave, and do a quick search for a topic your child or teen might be interested in. Right away, you’ll notice all the filters on the left-hand side. 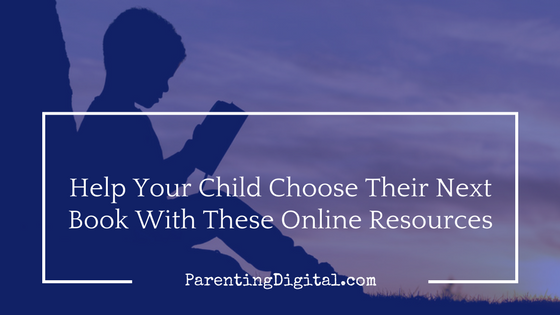 You can quickly hone your search to books in your child’s interest or reading level. Remember that Titlewave is designed for librarians, so there is a lot you can ignore. But under each book listing, you’ll find a few useful features. First, look at the “curriculum tags” that usually appear on each listing. These tags include themes, genres, subject headings, and even text features (like “Included Bibliography”). Clicking any of these tags will take you to search results for every title with that tag. You can then reapply the filters. The other incredibly useful feature is the review section that most books include. If the title has been reviewed, the review is included. Unlike Amazon reviews, these are reviews from sources like Booklist, Kirkus Review, School Library Review, and The Horn Book. Most of these honest reviews are written by librarians and include age and grade recommendations and any red flags. Other vendors, such as Mackin and Scholastic, have similar tools, but Titlewave is my go-to as a librarian and parent. If your state (through your state’s library resources) or your local library system has access to Novelist or Novelist K-8, take the time to check them out. These tools include a variety of book-selection resources curated by real librarians (OK, I’m biased.) You can certainly find book lists here on various subjects and themes, but you can also use features like read-alikes and author-alikes. These lists start, like YourNextRead, with a title you’ve read and liked. Then, you get a list of 10 books or so that match that title. If you liked Hunger Games, you might like these ten titles, for example. Same with the authors. Rick Riordan fans can read books by other authors like Riordan. You might have to do a little digging for this paid resource. Ask your friendly local or school librarian! There is no shortage of book review sites online, though there could be more for children’s and young adult literature. Here are just a few to get you started. The ALA has two divisions that center on kids, books, and literacy. Young Adult Library Services Association (YALSA) focuses on teens and provides book awards and lists for that age level (among many other resources). Association for Library Service for Children (ALSC) includes book awards and notable title reading lists for children. One of my favorite go-to resources for a lot of media issues, CommonSenseMedia also has a strong review section for books. Written from a parent perspective, their reviews give a deep-dive into the issues that might concern parents. Questionable content, difficult subject matter, and age-appropriate recommendations are all part of their detailed reviews. A product of the University of Wisconsin-Madison, the CCBC publishes a variety of lists and resources every year. For Christian parents, Focus has compiled a nice list of books by age level. PluggedIn book reviews, like their movie reviews, take a close look at media titles from a decidedly Christian worldview. The Dove organization also bases its reviews on Christian values and issues “seals” based on the level of violence, sexual content, language, faith, and integrity. Remember, as you are scouring reviews for appropriate books for your kids, the most significant quality of a title for them is “Will I like this?” Sure, be savvy about content, but your overall goal should be to cultivate and maintain the love of reading, especially as they get older and screens become a more significant part of their lives. What are your favorite sources and review sites for books? Add them to the comments below.